Sarah Bryan, a native of Arkansas, received her MFA in Costume Design and Technology from the University of Virginia and her BA in Film Studies from the University of North Carolina Wilmington. After graduating from UVA, Sarah worked for four years at California Polytechnic State University (Cal Poly) in San Luis Obispo, CA as the Costume Shop Manager for the Department of Theatre and Dance. There she also taught Costume History and Costume Construction as a Lecturer. Within her role in the Costume Construction course, Sarah implemented a service project benefiting a local Alzheimer’s & dementia residence. The students completed “activity” squares utilizing the sewing skills learned in class, and these squares were later sewn into “fidget blankets” for the residents. The blankets allow the residents to keep their hands busy in a constructive manner. 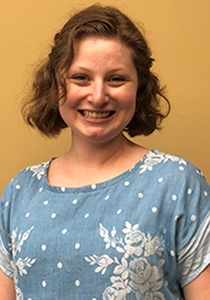 Sarah has designed a range of productions, most recently 4000 Miles (Cal Poly: San Luis Obispo, CA) and The 25th Annual Putnam County Spelling Bee (Performing Arts Institute of Wyoming Seminary: Kingston, PA). She has worked as a cutter/draper, first hand, stitcher, wardrobe supervisor, and assistant hair & makeup designer for other theatrical, dance, and opera productions. She is an Early Career member of the United States Institute of Theatre Technology (USITT). In 2017 she participated in a USITT Costume Commission study tour of England to further her education in Costume History. Sarah is also a member of The Costume Society (UK).